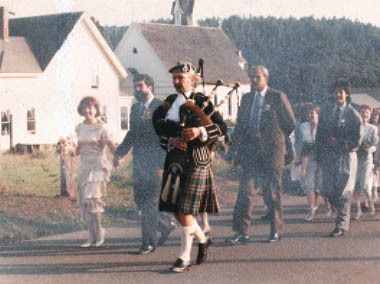 The sound of the bagpipes lends an elegant touch to any event whether somber or celebratory. With over 35 years as a professional bagpiper and a repertoire of hundreds of tunes, I work closely with clients to select exactly the right music for their setting. I live in Mendocino County, in Calfornia USA and perform throughout Northern California at weddings, memorials, parties, openings and ceremonial events of all types. For events that require larger numbers of bagpipers, I can provide a group of pipers who play to a very high standard. Please Contact Me To get a price quote for your event. Mendocino County: Branscomb, Boonville, Yorkville, Ukiah, Potter Valley, Willits, Laytonville Redwood valley, Hopland, Fort Bragg, Elk, Point Arena, Anchor Bay, Westport, Gualala, Mendocino. Lake County: Lakeport, Lower Lake, Upper Lake, Kelseyville, Cobb Mountain, Nice, Lucerne, Middletown. Humboldt County: Arcata, Eureka, Patrick's Point, Trinidad, Fortuna, Ferndale, Mattole Valley, Redway Blocksburg, Garberville Shelter Cove. Sonoma County: Santa Rosa, Cotati, Rhonert Park, Sonoma, Petaluma, Occidental Cazadero Plantation, Fort Ross, Guerneville, Forestville, Windsor, Healdsburg, Glen Ellen, Bodega Bay, Sea Ranch. Marin County: San Rafael, Tiburon, Belvedere, San Anselmo, Corte Madera, Ross, Kentfield, Fairfax, Forest Knolls, Larkspur, Mt Tamalpais, Novato, Mill Valley, Sausalito, San Quentin, Bolinas, Inverness, Point Reyes Station, Black Point, Tomales, Marshall, Napa Valley, Calistoga, St. Helena, Rutherford, Oakville, Yountville, Angwin. Sacramento Valley: Old Sacramento, Sacramento Carmichael Citrus Heights, Davis, Dixon, Elk Grove, Woodbridge, Lodi, Vacaville, Fairfield, Roseville, Rocklin, Grass Valley, Nevada City, Yuba City, Marysville, Chico, Gridley, Redding, Red Bluff, Mount Lassen, Mount Shasta, Stockton. San Francisco/ Bay Area : San Francisco, Richmond, Oakland, Palo Alto, San Mateo, Half Moon Bay, Sunnyvale, Los Gatos, San Jose, Saratoga, Vallejo, Benicia, Daly City, Berkeley, Martinez.